Here’s an extra simple way to make a long lasting sauce from your excess chill pepper fruit and easily preserve it. 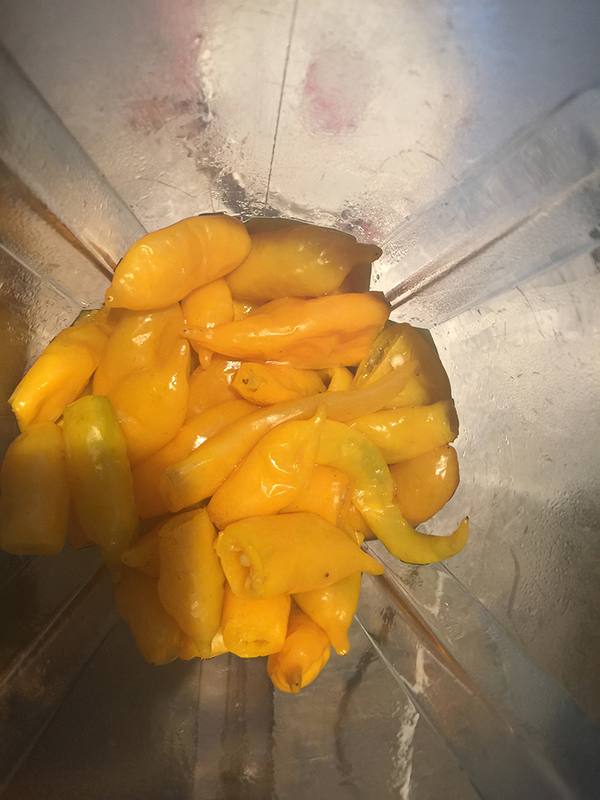 It’s based on a fairly minimal traditional way to make Aji Amarillo sauce. Chili pepper fruit will often go ‘off’ or break down quite quickly if left to it’s own devices. Aji can mean a few things – it can be a generic name for a sauce made with peppers and/or simply the name for a pepper which is usually of the species Capsicum baccatum. There is always a lot of extra produce in sudden batches when you grow Chili peppers or more specifically classic Aji ‘Capsicum baccatum’ as they tend to be long lived, quite large plants and very productive each fruiting period. I have a few varieties and forms and they all taste great and have a complex combination of flavours ie. 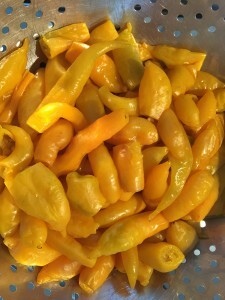 they often do not just have capsaicin producing the classic mouth heat – but a complex combination of related chemicals. 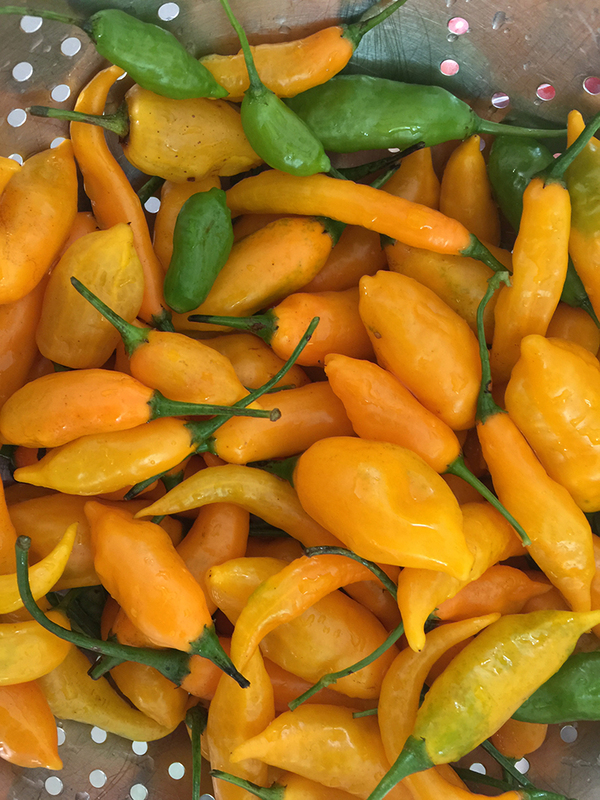 The heat varies a lot and some varieties can be quite hot but the flavours are always complex and very exciting. 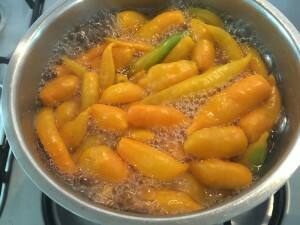 You have to decide how much heat you want to retain in the sauce and alter the process to match with a few experiments. It also depends a bit on how lazy you are… If you want to reduce the heat – deseed them. 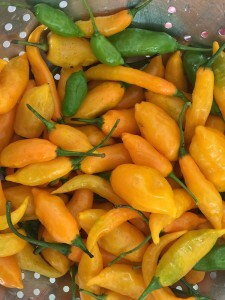 Most of the heat in chili peppers is in the seeds and the surrounding internal white tissue as that is where the capsaicin and other related chemicals are produced to protect the seed. You can also reduce the heat by repeating the washing and cooking stages to leach out more of the volatile oils. Also the eventual colour will obviously depend on the initial colour selection so stick with like-coloured fruit. 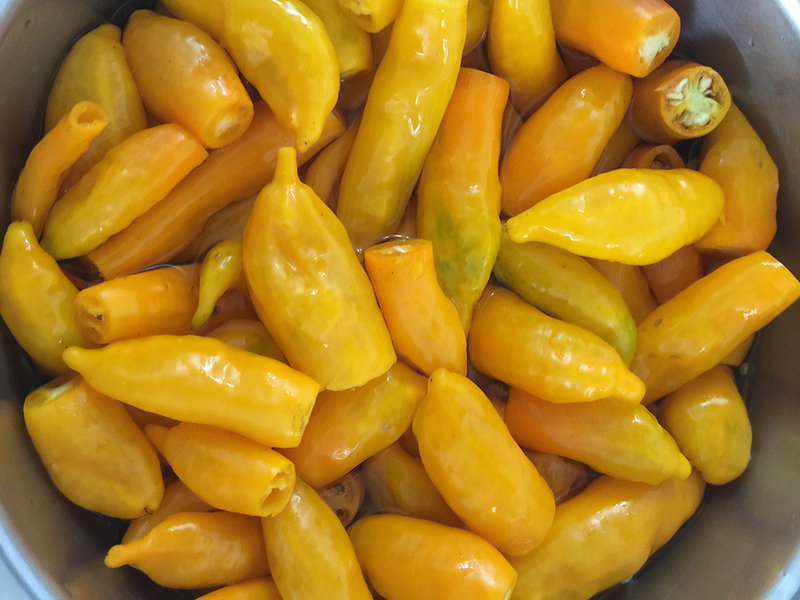 Aji amarillo sauce is usually yellow but the most used classic Peruvian Aji amarillo fruit is more of an orange colour when ripe. Trim the fruit down by cutting the stalk tips off and either use them whole or slice them. Wash the fruit well in cold water and discard the water. Place the fruit in a pot and cover them with water. Bring it to the boil and then simmer for about 10 minutes. Place the fruit in a blender and make a smooth sauce. Separate and store in freezer or fridge bags for use. Repeat the washing and cooking stages several times over to help reduce heat. Just taste the fruit at each stage to see how it’s going. 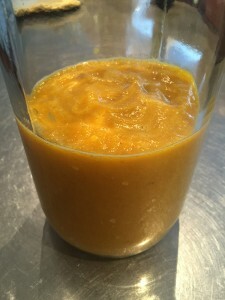 The sauce is great as an addition to things like pasta sauces and stocks for use with soups and slow cooking dishing etc.